Dental equipment manufacturers rely on Pneumadyne’s experience and expertise when integrating pneumatic products into their equipment. From standard Pneumadyne components to specialized fittings or valve assemblies, our engineering team provides valuable support when designing fluid handling circuits for use in dental equipment. Whether you are developing a new piece of dental equipment or evaluating an existing system, you can rely on our expertise in component & system design to ensure that your unique specifications are met. 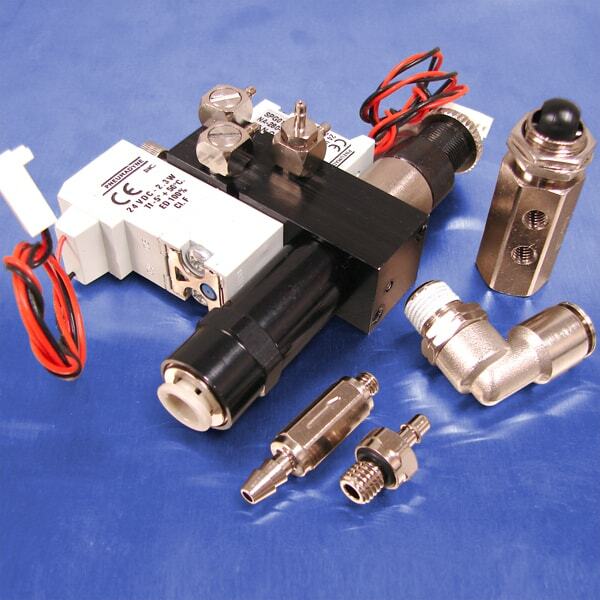 Learn more about how Pneumadyne helped one customer improve the assembly of an existing pneumatic circuit by consolidating several components into one distinctive valve assembly. The new assembly is delivered to the customer ready for installation, saving them time and money. Contact us to discuss your custom pneumatic component requirements. Many of Pneumadyne’s standard directional valves and pneumatic fittings are used throughout air and water delivery systems and air abrasion units. A variety of 2-way and 3-way On/Off Toggle & Routing Valves are available to accommodate the plumbing requirements of your system. Our miniature fittings feature several thread and barb sizes to easily connect pneumatic components throughout a delivery system. Originally developed for use in dental equipment, 6-Position Selector Valves are ideal for actuating up to six individual circuits from a common input port. Some of the most commonly used Pneumadyne components are featured below.